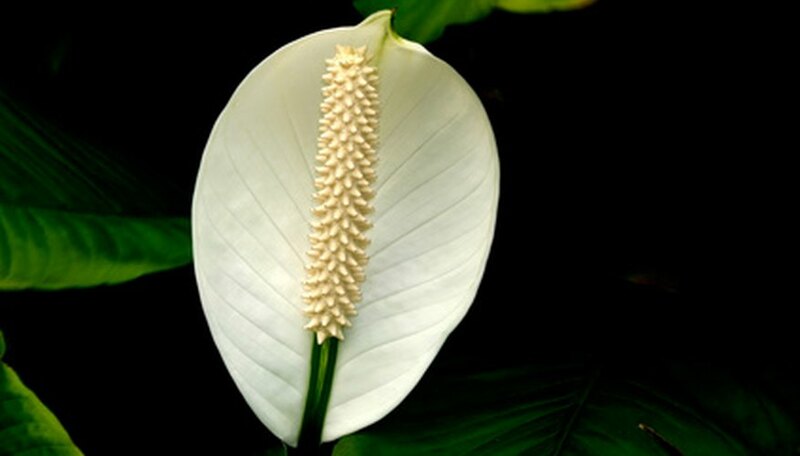 The peace lily (Spathiphyllum) has waxy green foliage and bright white flowers, the leaves and flowers grow from multiple stalks in the soil. The peace lily grows well as an indoor or outdoor potted plant. As the plant grows, you will need to transplant it into gradually larger pots. To decide if it is time to transplant, slide the rootball out of the pot, if the roots are tightly wound around the outside of the soil it is time to go up a pot size. Roots growing out of the drainage holes is another indication that it is time to transplant. Select a new pot that is 1 inch larger then the old pot. Peace lilies like to be a little pot bound, a sudden jump in pot size will stress a healthy plant unnecessarily. Find a pot that has several drainage holes in the bottom. Place a few shards of broken pottery over the drainage holes to allow water to drain through while keeping the soil from seeping out. Fill the pot half-full with a well-draining potting soil mix. Nurseries and garden stores sell premixed formulas; look for a peat-based soil mix or other light potting soil. Turn the peace lily on its side in the old pot and gently slide it from the pot. Grasp the base of one of the sturdy stems and gently wiggle it free. If it is badly root bound and you don't care about losing the pot it is in, cut or break the pot away from the root ball. Place the root ball into the new pot with the base of the stems about 1 inch lower than the lip of the new pot. Fill in the soil under and around the root ball. Build up the soil level so that it is 1 inch below the lip of the pot and just covers the root ball. Soak soil around the root ball until water seeps from the drainage holes. Place the pot outside or in the sink to drain thoroughly. If you use a tray or saucer to catch water and protect surfaces, empty it after every watering. The ideal temperature range for peace lilies is between 68 and 85 degrees F during the day, 60 to 75 at night; temperatures below 60 degrees F will damage and kill the plant. Keep peace lilies in a shaded area of the garden or in a bright room with filtered sunlight. Direct sunlight will damage the leaves and flowers and stress the plant. Fertilize sparingly every three to four months with a balanced 20-20-20 fertilizer, brown leaf tips are a sign of over fertilization.